This report describes the challenges of measuring unobserved events such as tax cheating, drug smuggling, or illegal immigration. 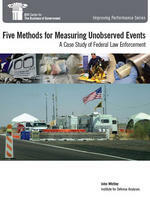 This report describes the challenges of measuring “unobserved” events – such as tax cheating, drug smuggling, or illegal immigration. These differ from “infrequent” events (another measurement area where success is difficult to judge), such as a terrorist attack. A key insight offered by Dr. Whitley is that there is often “institutional resistance to diverting scarce resources from enforcement to data collection and measurement.” But he says that when law enforcement leaders do make the leap, they quickly become champions of the use of data. Local police departments across the country have begun to use these kinds of techniques to undertake what has become known as “predictive policing” – where police move officers to places where crime is predicted to occur rather than responding to crimes that have occurred.